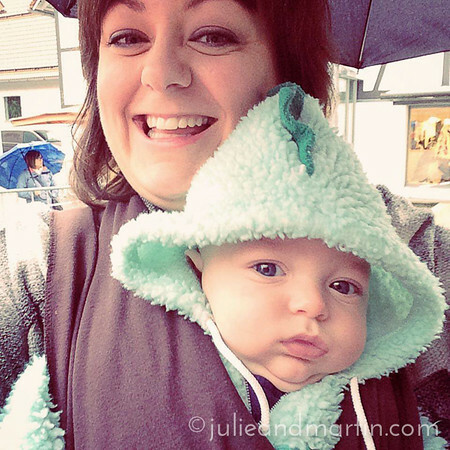 My cousin Holli and I abandoned our husbands took our kids (and Wynter!) down into Bavaria to get up close and personal with hundreds of cows this morning. 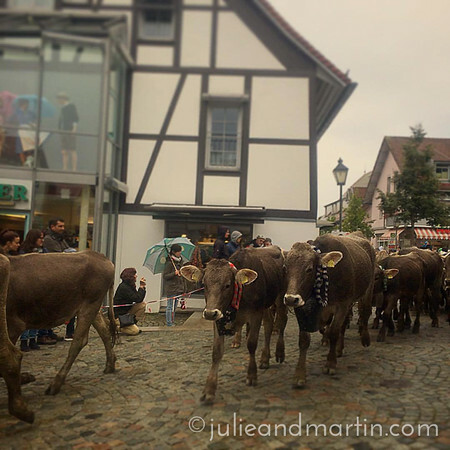 About 1,000 cows were escorted off the mountains and led thru the village of Immenstadt to their farms. The tradition goes back centuries all throughout Bavaria. It takes place every September/early October. This was the first time any of us experienced it. It’s called the Viehscheid, or the return of the cows after they spent 100 days up in the Alps munching on the lush grass up there. When the season changes into autumn, the herds are rounded up and led through town. The biggest cows are decorated with flowers and garland, and all of them wear HUGE metal cow bells. 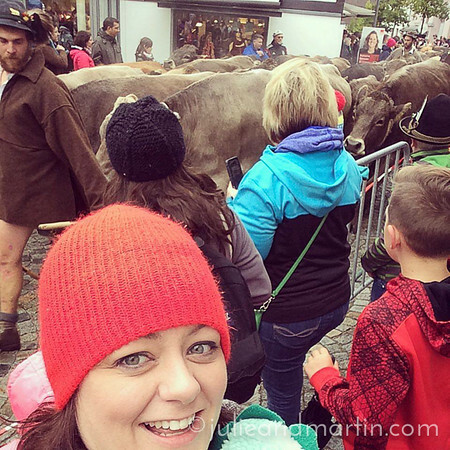 The noise and vibrations from the massive cow bells, and the sheer energy from those huge, gentle beasts…it was all pretty intense! Especially since we were right there on the street next to them with only red and white barricade tape and a few unstable metal barriers separating us. About 1,000 cows were escorted off the mountains and led thru the village to their farms. 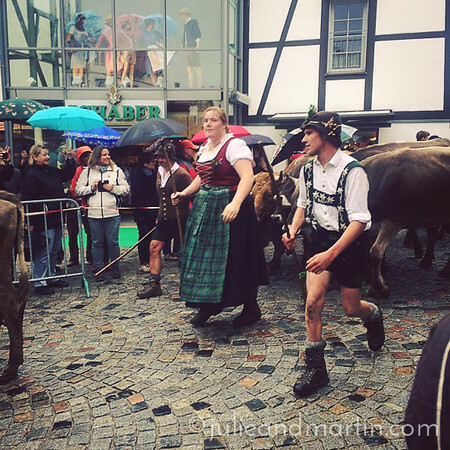 The tradition goes back centuries all throughout Bavaria. It takes place every September/early October. We were up close and personal with hundreds of cows this morning. 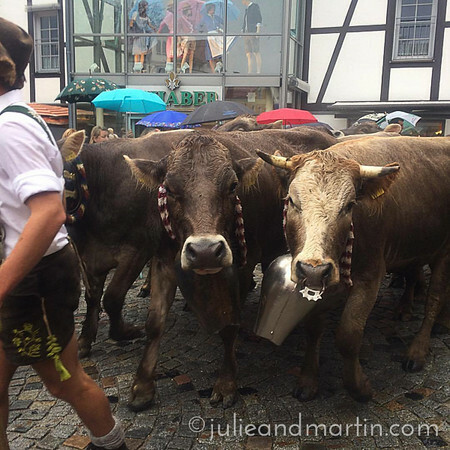 The noise and vibrations from the massive cow bells, and the sheer energy from those huge, gentle beasts…it was all pretty intense! Wrapped up and ready to watch the cows come home from off the mountains after they grazed all summer. After most of the herds came by, we drove just outside of town to a recreational park just at the base of the mountains. We ate lunch at the restaurant, and warmed up with hot chocolate and coffee. I, of course, ordered the local bread, sausage, and mustard. Ah, Bavaria. 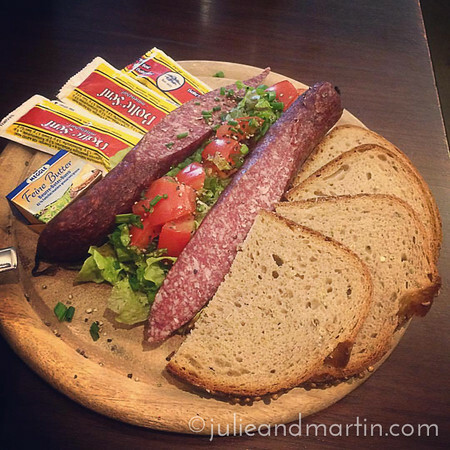 Lunch was a platter of the local bread, sausage, and mustard. Ah, Bavaria. After lunch, I took them to the other side of the building to get our tickets. My cousin gets a little anxious about heights, so what do I do? 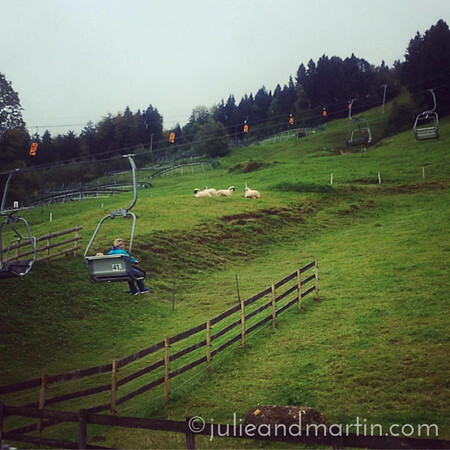 Put her and all the kids on a ski lift on THEE highest Alpine coaster in Germany and send them up, up, up OVER the clouds (and some sheep) so they can see the view before rolling all the way down on a cart. 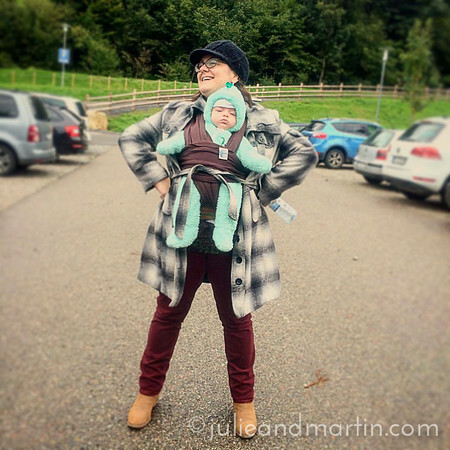 I waited at the bottom of the mountain with the baby and Jaz, and could hear the group screaming as they all came down on the carts. It was hilarious. They all loved it. So much that the kids were SUPER disappointed when they realized they couldn’t go a second time. 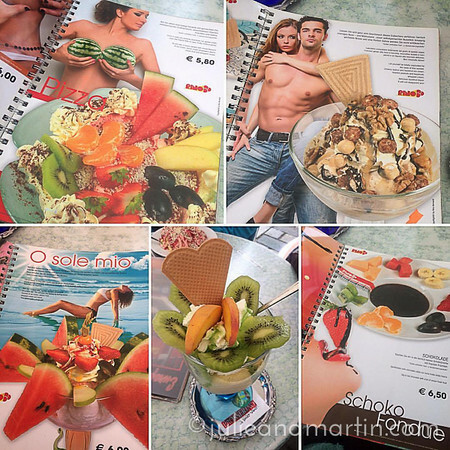 But no worries — we went back into town for ice cream, where we could order dessert from the world’s sexiest ice cream menu. 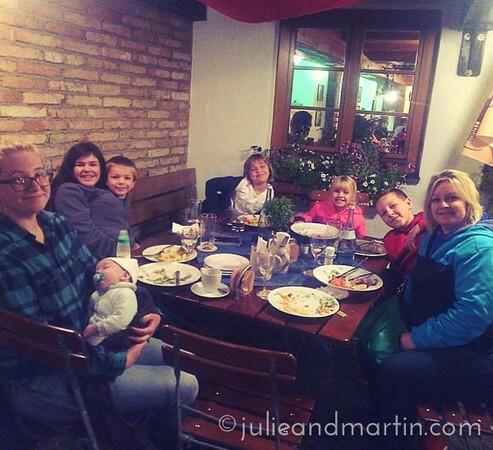 Later, we traveled into Ulm for dinner, and even though we had six children at the table, we all seemed to really enjoy ourselves. 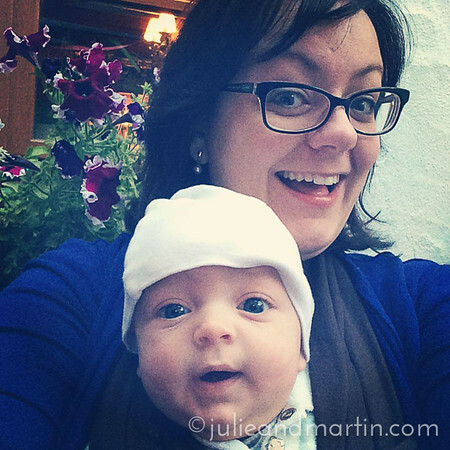 I am so, so thankful for the opportunity to travel and introduce the things we love about Germany to part of my family. Being able to talk to Holli and share the same stories while also creating new memories with all our kids together … that’s such a gift. Snapped this while waiting for dinner. He is the best travel companion: always cheerful, packs lightly, is mostly quiet, but always interested in whatever is going on. An awesome sleeper, and will eat on the go. (Yea!) And he takes great selfies.